But after some further investigation it was clear, that Oracle has released a new forums version with some web 2.0 features (tag cloud, FAQ in a wiki). One bad thing is, that OTN has not informed anyone about this upgrade and no documentation is available (see this discussion). This discussion shows one of the new features (emoticons) but this is not really needed on a technical forum. 4. Each post has an icon added, which show "click to report abuse..." as tool tip. What software do they run on? 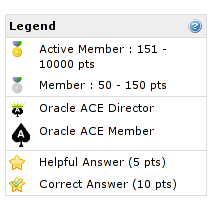 Oracle Discussion Forums run on version 4.2 of Jive Forums. An ungrade to v 5.5, originally scheduled for July 1, has been delayed.